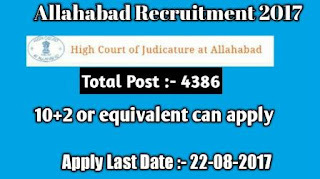 Allahabad High Court, uttar pradesh has released the notification for the recruitment of Junior Assistant, Driver, Stenographer, Group-D post. Eligible candidates can apply this govt jobs online till 22-08-2017. 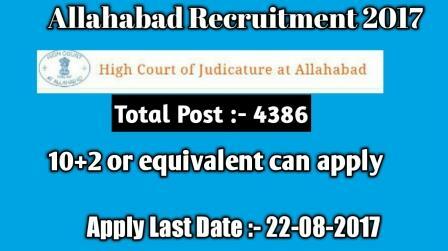 Allahabad High Court and Uttar Pradesh has Publish Notification of 4386 post. you can apply online till 22-08-2017. who want to work with this organization they can apply below Links. Qualification :- High School with driving licence. in Hindi and 30 English. The candidates who meet all eligible criteria related to these graduate and diploma post. Selection on the basic of their your performance round of selection area as follows.